Maybe, but doesn’t seem like a high probability to me that there are many out there with that Mako wanting to go the other direction. My first Vette was the 73 and appreciate them all but wouldn’t trade a C3 for a C5 even if you tossed in an organ. Sell the C5 to someone that has always wanted one and buy the Mako version that you want and love. You have a very nice one and it will be highly sought after by someone else. Probably the best suggestion I have heard. Sell the C5, the buy the Daytona or Mako. 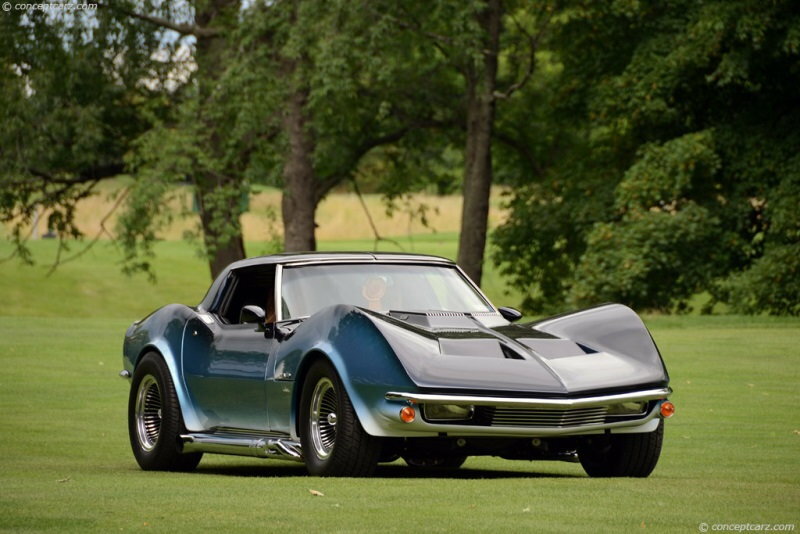 Just to be clear, when I say Mako Shark, I am not talking about a standard C3 Corvette. I am talking about a Mako Shark kit installed om a C3 Corvette. 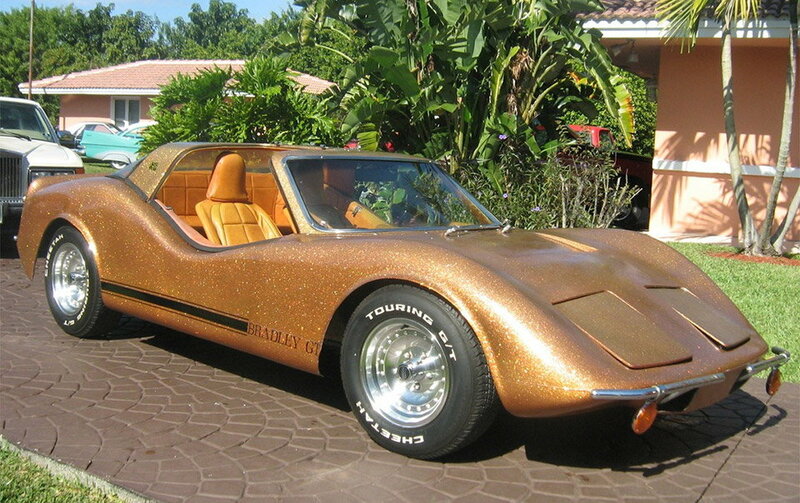 Dream on, that paint job alone is more than $20K. Saw it at its intro at the New York Auto show in 65. I am not expecting THAT Maco Shark. 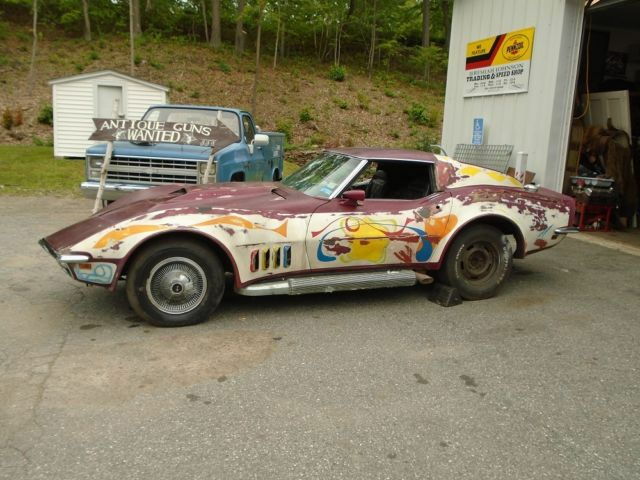 The picture I posted was just to show people what I am talking about when I say Maco Shark Corvette. I am looking for a nice driver quality car, somewhere in the $20K to $25K range. If you know what you want, and need to make a hole in the garage for it anyway, it's a no-brainer to sell your C5 immediately. Spring is the time to unload a fun convertible. Then you'll be ready to pounce on an opportunity when one comes up. Pretty sure it's Mako Shark. Last edited by Bikespace; 03-09-2019 at 07:22 PM. I would absolutely LOVE a Burnie Daytona replica.......the two that I have seen were nicer than the Ferrari it is based off of. Could you imagine a Burnie Daytona with an Aluminum 555 Big Block and a Tremec 6 speed? Al Bundy was the first cop killed off in the pilot of Miami Vice. Last edited by derekderek; 03-10-2019 at 07:32 AM. I tried to pm you but your mailbox is full. I cannot locate the car you are talking about. Can you point me at it. Sell em both and buy a very nice C3. I'd buy a C7, though. Already had a C3. The 64 is a keeper. I have owned a number of nice C3s over the years. What I am interested in is a flashy car, like a Mako Shark or a Daytona replica, both of which I have wanted for many years. 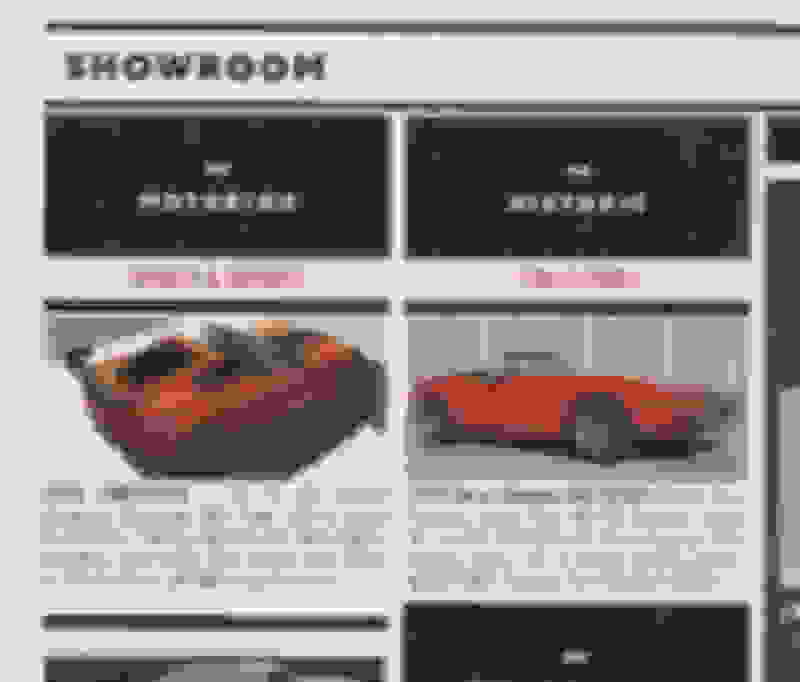 Unable to find it on the AutoWeek website, this is all I've got. So you want to get rid or or trade a 21K mile original C5 for a kit car? Even though your C5 is losing value right now it will bottom out and start to rise again. Interesting car, although I m being generous in calling it a car. Reflectors hanging off the front "handlebars"?. And in back, a Plymouth (?) in turquoise and white with fender skirts. Gotta be FL somewhere. Last edited by ignatz; 03-15-2019 at 04:23 PM. A friend of my Dad had one in the early '70's. It's just a kit body put on a VW of course. Sort of like the dune buggy bodies. Comes with all kinds of options like gull-wing doors, fast back style etc. I remember my Dads friend had the gull-wing door option. He was not the hideous sparkle gel coat. He had a paint job on it. Being around 10 at the time we all thought it was pretty cool. OK, back to the discussion of my sanity. I drove the 2004 to work today. Beautiful car, drives great, runs great, looks great, and does very little for me emotionally. I got the Vintage Air installed in my 64 coupe, and I love driving that car, even more than I did before. The 04 had an issue a few weeks ago. It set an OBD II code of P0300, random cylinder misfire. My code reader told me this much. I took it to an LS engine specialist. He checked it with his laptop and determined that the car needed a tuneup (new plugs and wires). It had the originals of both in it. Car got a tune up with quality parts, and now runs even better than before. 20K miles on the plugs, but they were 14 years old. The 04 Corvette is back up for sale. I want a car that excites me emotionally, that I am able to work on myself (or at least understand what is wrong with it without a computer), and that has some WOW factor. I had earlier indicated that I was interested in either a Ferrari Daytona replica (based on a C3 Corvette), or a Mako Shark Corvette (based on a C3 Corvette). 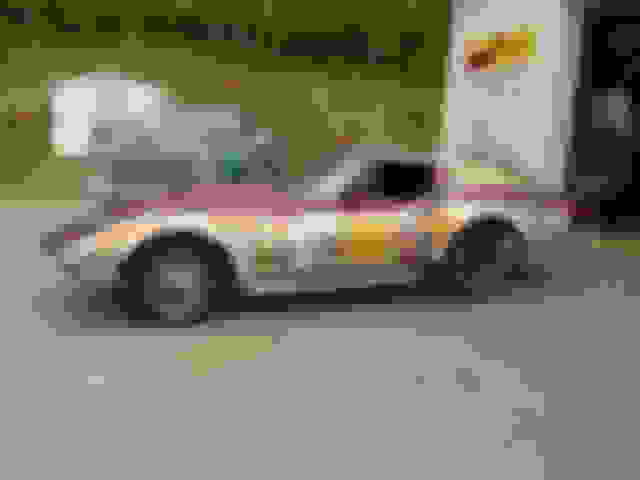 I also threw in there the possibility of interest in a nice AMC Pacer (if there was any question of my sanity, it just went out the door with the Pacer idea ). 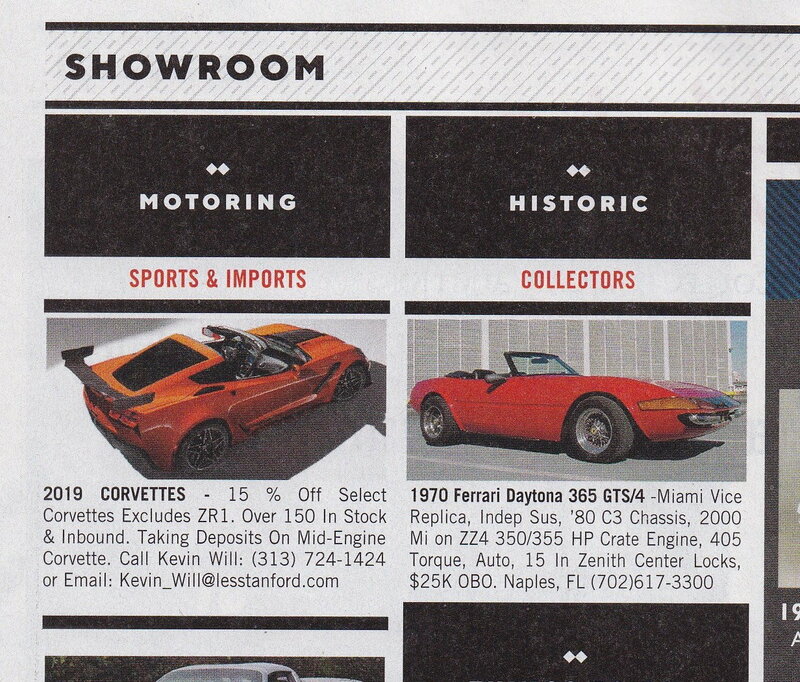 So, thinking about these options, and knowing what I want to do with the car, the Mako Shark Corvette is a bad idea. A Mako Shark Corvette is not a cruiser, and should not be turned into one. It is a serious ground pounder, but my ground pounding days are over. If I had a Mako Shark, I would want it to have a ZL-1 engine (one of the newer re-makes of the original 69 version), a 5 speed transmission, 4.11 rear end, and maybe power steering and power brakes. No A/C. I would also prefer coupe roof be modified so it was one piece and it raised up like the original show car. When all is said and done, this would not be a cheap car. OK, moving on to the Ferrari Daytona replica, this is much more of a cruiser, and I could even live with an automatic transmission in this car (might even prefer that). In a perfect world, the power plant would be replaced by a Jaguar or BMW V-12 just because, but I could live with a V-8 chevy. If money wasn't an object, I would look into making a V-12 Chevy, but that will never happen. Car would need all of the creature comforts (P/S, P/B, A/C, Power windows (probably), cruise control, keyless entry, power door locks, high quality leather interior, high quality convertible top, nice quality wire wheels, .... you get the idea. What I really would love to have is a decent quality replica of a Ferrari Dino 246 GTS. There is a company in England that makes them out of Toyota MR2, but they are not cheap. However, I think that is perhaps one of the three best looking cars I have ever seen. Anyway, the 2004 is for sale, and in a perfect world, I could just trade it for one (or more) of my desires. Life is too short. OK, now back to your regularly scheduled program.